The blades of this razor-sharp pruner are forged from the finest Japanese steel (the same steel from which the Katana sword of the Samurai are made), and enable you to effortlessly cut through branches up to 25 mm, such as shrubs, roses, fruit trees, and creepers. Pruners bypass work like scissors where two blades pass by each other. 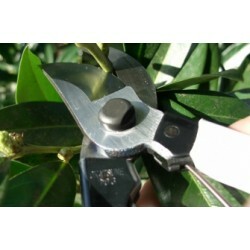 When you use a pruner correctly you will do almost no damage to the plant. Okatsune pruners are the undisputed number 1 in Japan: the country where pruning has been elevated to true art. With its length of 180 mm the Okatsune 101 is the most compact pruner of the 3 models, and hereby pa..